That the Islamic State (IS) in da'wa (religious outreach) is well-known and much of it is publicized online through IS propaganda, but there are still many IS works that remain unpublished on the Internet and distributed on the ground only. One such da'wa series is called qisas al-mujahideen ('Stories of the Mujahideen'). This series has been distributed under the heading of Akhbar al-Khilafa ('News of the Caliphate'), which also includes IS news announcements published online, and more formally with the mark of the Diwan al-Da'wa wa al-Masajid ('Da'wa and Mosques Department'), one of the series of formal diwans created following the announcement of the Caliphate. 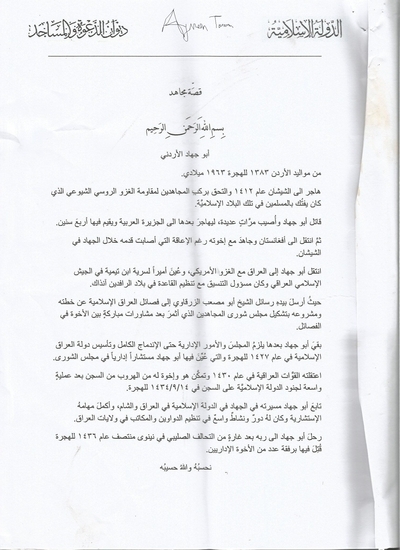 Indeed, the Diwan al-Da'wa wa al-Masajid issued a document (above) outlining that the qisat al-mujahid ('story of the mujahid'- singular of qisas al-mujahideen) is a "series from the activities of the Diwan al-Da'wa wa al-Masajid shedding light on pictures of the mujahideen whom God selected as we reckon them, and they departed to the abode of truth after they knew the truth and worked by it. And they participated in establishing the Islamic State, all according to what God brought. For among them are those who did so by their speech and tongue, and those by their sword, and those who brought these people all together." 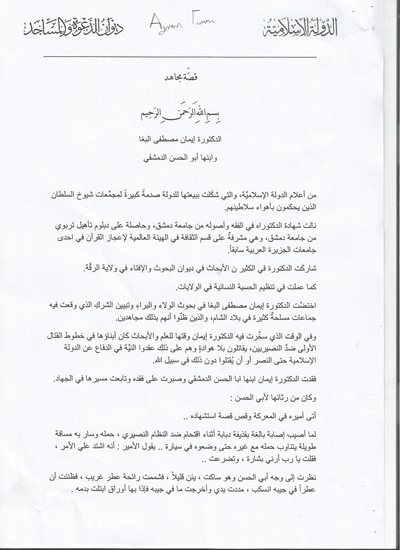 As the document explains, the primary target audiences of these qisas al-mujahideen are the IS fighters, for they constitute "a da'wa series strengthening the resolve of the mujahid as a soldier of the Caliphate, increasing his strength, and strengthening his resolve and determination." "For however strong the trials and tribulations become, and however much the force of kufr intensifies and the Islamic State retreats in the fields of the land, it [the Islamic State] began from nothingness on the land, and its reliance has been fear of God and His victory. And strong mujahideen have borne it even as they did not expect one day that God would open the door of conquest at their hands, but rather they placed their bodies as wood for the passing of the generations of the Caliphate subsequently, for God supported them, strengthened them, raised their prestige, and through them terrorized the enemies of the religion. The Islamic State arises on the creed of the soldier of the Caliphate who works and strives in the darkest of circumstances relying on God and being certain that there is no granter of victory but He." 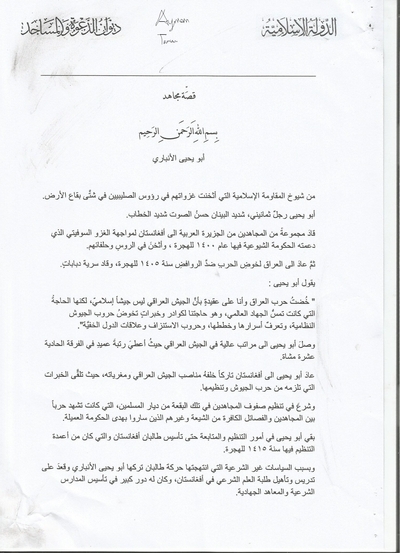 The document concludes with a call for IS fighters to heed the example of these mujahideen: "So be firm, our brothers in the Islamic State, and let there be for you from the qisas al-mujahideen a sign and proof that God is with the truthful, even if they are few." Unsurprisingly, some of the stories related in qisas al-mujahideen refer to important figures within IS, thoughthey are not generally known to the outside world. For example, Abu Yahya al-Anbari and Abu Jihad al-Urduni, personalities featured in this series who reputedly contributed to the development of IS administration, do not appear in public discussions of personalities in IS, at least under these names. Perhaps even more interesting is that the series profiles women as well as men. Though not necessarily out fighting on the frontlines, the women are presented as waging jihad through providing support for the fighters and contributing to the building of the IS project, rather than just staying at home and having children. 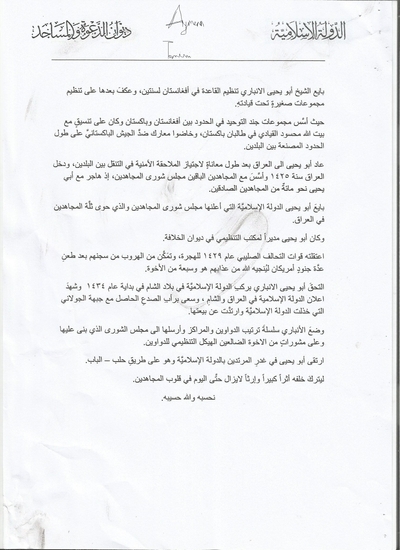 The case I have selected here for viewing- Dr. Iman Mustafa al-Bagha- is one well-known in the Arabic press (indeed, part of the IS biography of her appears to have plagiarized some of the al-Quds al-Arabi article linked to). According to the biography, she has notably helped contribute to studies of theDiwan al-'Iftaa' wa al-Buhuth (Fatwa Issuing and Research Department), a body most commonly associated with the Bahraini cleric Turki Binali. 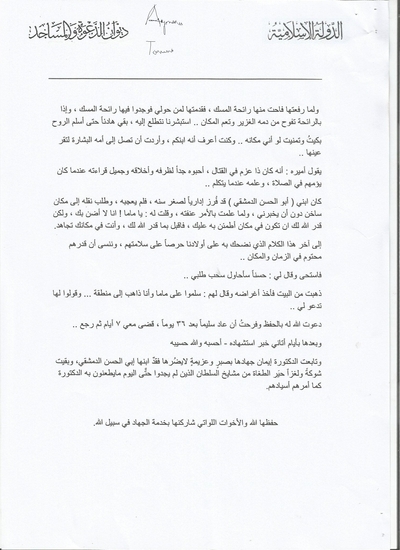 Below is a sample of the qisas al-mujahideen documents that I have obtained, with explanatory notes in square brackets where applicable. From the sheikhs of the Islamic Resistance that inflicted their expeditions as massacres on the heads of the Crusaders in different parts of the world. Abu Yahya was an octogenarian man, of strong physique, sound voice and fierce address. He led a group of the mujahideen from the Arabian Peninsula to Afghanistan to confront the Soviet invasion that was supported by the Communist government in it in the year 1400 AH [1979-1980 CE], and he inflicted massacres on the Russians and their allies. Abu Yahya attained high ranks in the Iraqi army when he was given the rank of a brigadier in the 11th infantry division. Abu Yahya returned to Afghanistan, leaving behind him the positions and temptations of the Iraqi army, as he had attained the skills of experience that he needed as regards the war of the armies and their organization. And he began organizing the ranks of the mujahideen in that part of the Muslims' abode, which was witnessing a war between the mujahideen and the factions of kufr from the Shi'a and others besides them who went by the guidance of the collaborationist government. Abu Yahya remained in matters of organization and tracking until the establishment of the Taliban of Afghanistan. He was among the pillars of organization in the movement in the year 1415 AH [1994-1995 CE]. But because of the non-Shari'i politics that the Taliban movement adopted, Abu Yahya al-Anbari abandoned it and worked on teaching and qualifying students of Shari'i knowledge in Afghanistan, and he had a big role in establishing the Shari'i schools and jihadi institutes. 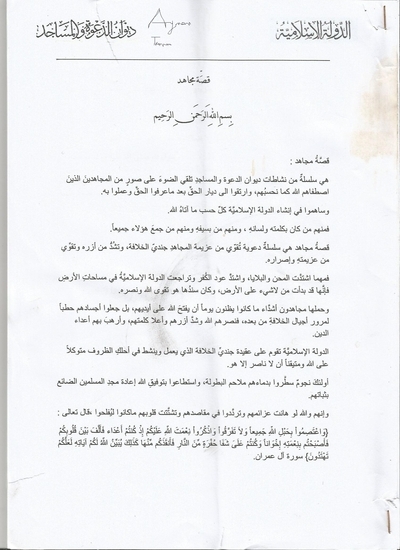 Sheikh Abu Yahya al-Anbari gave bay'a [allegiance] to the al-Qa'ida organization in Afghanistan for two years, and after that he worked assiduously on organizing small groups under his leadership, as when he established the groups of Jund al-Tawheed on the borders between Afghanistan and Pakistan, and coordinated with Baytullah Mahsoud the commander in the Taliban of Pakistan, and they waged battles against the Pakistani army on the length of the artificial borders between the two lands. Abu Yahya returned to Iraq after a period of tribulation to surpass the pursuit of the security apparatus in moving about between the two lands, and he entered Iraq in the year 1425 AH [2004-2005 CE]. And he established with the rest of the mujahideen the Majlis Shura al-Mujahideen, as there migrated with Abu Yahya up to 100 of the truthful mujahideen. Abu Yahya gave bay'a to the Islamic State that the Majlis Shura al-Mujahideen announced, which included the cream of the crop of the mujahideen in Iraq. And Abu Yahya was a director for the office of organization in the Diwan al-Khilafa [appears to refer to the period of Islamic State of Iraq 2006-2010 CE. If so, it suggests clear Caliphate designs in the time of Abu Omar al-Baghdadi]. The Crusader alliance forces arrested him in 1429 AH [2008-2009 CE], but he managed to escape from their prison after attacking a number of American soldiers so that God might free him from their torture, together with seven of the brothers. Abu Yahya joined the retinue of the Islamic State in Bilad al-Sham in the beginning of the year 1434 AH [c. November 2012 CE, when Islamic State of Iraq began pushing behind the scenes for formal expansion into Syria by trying to secure the subsuming of Jabhat al-Nusra], and he witnessed the announcement of the Islamic State in Iraq and al-Sham, and he tried to mend the rift that occurred with the Jowlani front that abandoned the Islamic State and renounced its allegiance. Al-Anbari put forth the series of arrangement of the Diwans and centers and sent them to Majlis al-Shura, which built the organizational framework for the Diwans upon that and upon the consultations of the supporting brothers. Abu Yahya died through the treachery of the apostates against the Islamic State while on the Aleppo-al-Bab road, leaving behind him a big mark and legacy that still lives on till today in the hearts of the mujahideen. Thus we reckon him and God is his reckoner. Born in Jordan in 1383 AH corresponding to 1963 CE. He migrated to Chechnya in the year 1412 AH [1991-1992 CE] and joined the retinue of mujahideen to resist the Communist Russian aggression that was killing the Muslims in that Islamic land. Abu Jihad fought and was wounded many times, migrating after that to the Arabian Peninsula and living there for 4 years. Then he moved to Afghanistan and waged jihad there despite the impediment that had struck his foot during the jihad in Chechnya. 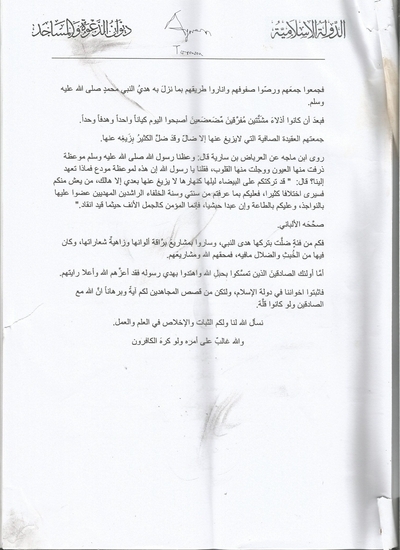 Abu Jihad moved to Iraq with the American invasion, and was appointed an amir for the Ibn Taymiyya brigade in the Iraqi Islamic Army, and he was responsible for coordination with Tanzim al-Qa'ida fi Bilad al-Rafidayn at that time, as he sent by his hand the messages of Sheikh Abu Mus'ab al-Zarqawi to the Islamic factions of Iraq concerning his plan and project to form the Majlis Shura al-Mujahideen that resulted after blessed consultations between the brothers in the factions. Abu Jihad continued after that to adhere to the Majlis and administrative matters until the complete merger and establishment of the Islamic State of Iraq in the year 1427 AH [October 2006 CE], in which Abu Jihad was appointed as an administrative advisor in the Majlis al-Shura. The Iraqi forces arrested him in the year 1430 AH [2009-2010 CE], and he and brothers to him managed to escape from the prison after a wide operation by the soldiers of the Islamic State on the prison on 14 Ramadan 1434 AH [the Abu Ghraib prison break in July 2013 CE]. Abu Jihad continued his path in jihad in the Islamic State in Iraq and al-Sham, and completed his advisory assignments. He also had a broad role and function in organizing the Diwans and offices in the Iraq wilayas. Abu Jihad departed to His Lord after an air-raid from the Crusader alliance in Ninawa in the middle of 1436 AH [c. March-April 2015 CE], in which he was killed along with a number of the administrative brothers. Salah al-Din was born into a Christian family in Damascus, raised under the wing of deceit and what the clergymen of the church impose upon them from deceit and beguiling the hearts and minds. Salah al-Din joined the kafir [disbeliever- non-Islam] militias called the National Defence in Aleppo, and he was responsible for ammo depots in the town of al-Safira. The soldiers of the Dawla managed to capture him and a group of apostates of the National Defence in an expedition on the peripheries of al-Safira, and he remained in their captivity for three months, during which time God opened his heart to Islam and he desired to memorize the Qur'an and implement it. Salah al-Din demanded from the prison commander that he should meet the wali of Aleppo, but it was a strange matter for the prison commander who heeded his request after Salah al-Din persisted in his request. The wali of Aleppo came after a time to Salah al-Din's prison, and it came to pass that he sat with him for hours, in which he then went out to bring Salah al-Din to the training camps of the brothers in the wilaya of Aleppo. Salah al-Din spent two months in the camp and was then dispatched to the al-Safira area in the same place that he was taken prisoner. He connected with his family, informed them of his story, and called on them to repent and live in the protection of the rightly-guided Caliphate, and that the religion of Islam is the religion of deliverance, but they did not listen. Salah al-Din fought in dozens of the expeditions against the Nusayris and was martyred during an inghimasi [commando] operation by the lions of the Caliphate on the peripheries of al-Safira town. We ask God to accept him. From the luminaries of the Islamic State, who, by their allegiance to the Dawla, caused a great shock for the associations of the Sultan sheikhs who judge by the whims of their sultans. She obtained a doctorate in fiqh [Islamic jurisprudence] and its principles from the university of Damascus, obtaining a teaching qualification diploma from the university of Damascus, and supervising the culture division in the global committee for the inimitability of the Qur'an in one of the universities of the Arabian Peninsula previously. The doctor has participated in many of the studies in the Diwan al-Buhuth wa al-'Iftaa' in the wilaya of Raqqa, and she has worked in organizing the women's Hisba in the wilayas. Dr. Iman Mustafa al-Bagha has specialised in researching al-wala' and al-bara' and making clear the shirk into which many armed groups have fallen in the land of al-Sham- those who have thought that they are thus mujahideen. And at the time at which Dr. Iman has focused her time on 'Ilm and studies, her sons have been on the frontlines of fighting against the Nusayris, fighting without leniency and having decided to defend the Islamic State until victory or otherwise being killed in the path of God. 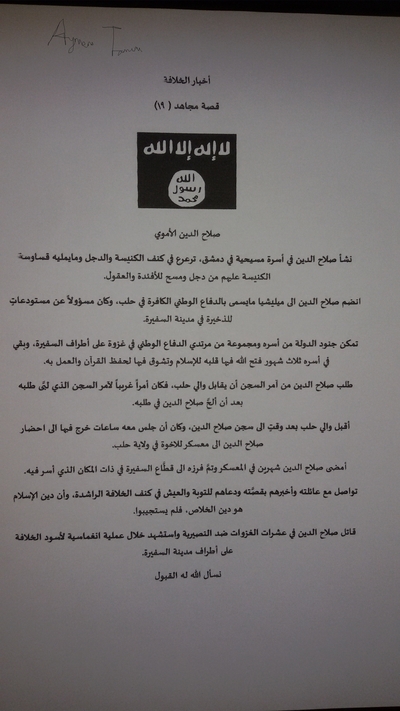 Dr. Iman lost her son Abu al-Hassan al-Dimashqi and has endured his loss and continued her path in jihad. 'I looked at the face of Abu al-Hassan as he was silent, approaching a little, but I smelt the odour of a strange perfume, and I thought a perfume had poured out in his pocket. I stretched my hands and dragged out what was in pocket, for behold, in it were papers stained by his blood. So when I raised them, the odour of musk emanated from them, so I presented them to those around me, and they found in them the odour of musk, and lo, the odour was emanating from his abundant blood and spreading across the place...we rejoiced, looking at him. He remained calm until he died. Thus with this talk by which we deceive our children out of concern for their safety, yet we forget that their fate is set in time and place. And some days after that came to me the news of his martyrdom- thus I reckon him and God is his reckoner. Dr. Iman has continued her jihad with patience and determination, not being harmed by the loss of her son Abu al-Hassan al-Dimashqi, and she has remained a thorn and enigma that has confused the tughat from the sheikhs of the sultan who have not until today found anything by which they may attack the doctor as their masters ordered them. May God protect her and the sisters that have participated with her in the service of jihad in the path of God.